B. Sohngen, S. Brown, 2006. 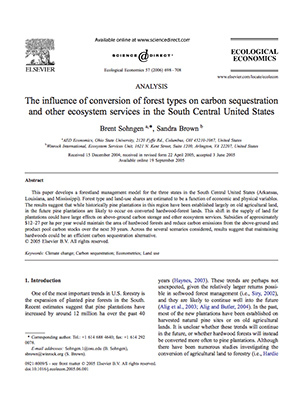 Analysis: The Influence of Conversion of Forest Types on Carbon Sequestration and Other Ecosystem Services in the South Central United States. Ecological Economics 57 (2006) 698-708, published.